This post discusses some of the work we’ve been doing to lay foundations beneath the requirements for a ‘preservation system’ here at Cambridge. In particular, we’re looking at the core vision for the system. It comes with the standard ‘work in progress’ caveats – do not be surprised if the actual vision varies slightly (or more) from what’s discussed here. A lot of the below comes from Mastering the Requirements Process by Suzanne and James Robertson. Also – it’s important to note that what follows is based upon a holistic definition of ‘system’ – a definition that’s more about what people know and do, and less about Information Technology, bits of tin and wiring. Why does a system change need a vision? New systems represent changes to the existing status-quo. The vision is like the Pole Star for such a change effort – it ensures that people have something fixed to move towards when they’re buried under minute details. When confusion reigns, you can point to the vision for the system to guide you back to sanity. Plus, as with all digital efforts, none of this is real: there’s no definite, obvious end point to the change. So the vision will help us recognise when we’ve achieved what we set out to. Defining what the system change isn’t is a particularly good a way of working out what it actually represents. This can be achieved by thinking about the systems around the area you’re changing and the information that’s going to flow in and out. 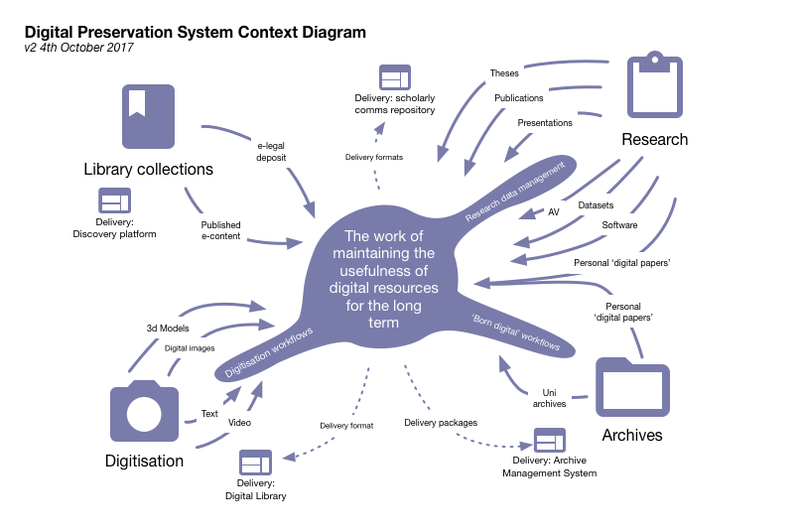 This sort of thinking makes for good diagrams: one that shows how a preservation repository system might sit within the broader ecosystem of digitisation, research outputs / data, digital archives and digital published material is shown below. Being able to concisely sum-up the key goals of the system is another important part of the vision. This is a lot harder than it sounds and there’s something journalistic about it – what you leave out is definitely more important than what you keep in. Fortunately, the vision is about broad brush strokes, not detail, which helps at this stage. I found some great inspiration in Sustainable Economics for a Digital Planet, which indicated goals such as: “the system should make the value of preserving digital resources clear”, “the system should clearly support stakeholders’ incentives to preserve digital resources” and “the functional aspects of the system should map onto clearly-defined preservation roles and responsibilities”. Who are we implementing this for? 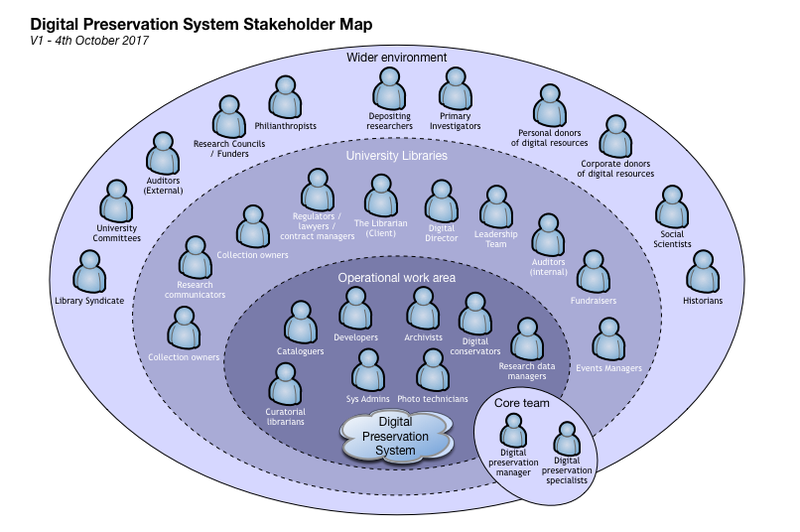 The final main part of the ‘vision’ puzzle is the stakeholders: who is going to benefit from a preservation system? Who might not benefit directly, but really cares that one exists? Any significant project is likely to have a LOT of these, so the Robertsons suggest breaking the list down by proximity to the system (using Ian Alexander’s Onion Model), from the core team that uses the system, through the ‘operational work area’ (i.e. those with the need to actually use it) and out to interested parties within the host organisation, and then those in the wider world beyond. An initial attempt at thinking about our stakeholders this way is shown below. One important thing that we realised was that it’s easy to confuse ‘closeness’ with ‘importance’: there are some very important stakeholders in the ‘wider world’ (e.g. Research Councils or historians) that need to be kept in the loop. The repository is the place where the best possible copies of digital resources are stored, kept safe, and have their usefulness maintained. Any future initiatives that need the most perfect copy of those resources will be able to retrieve them from the repository, if authorised to do so. At any given time, it will be clear how the digital resources stored in the repository are being used, how the repository meets the preservation requirements of stakeholders, and who is responsible for the various aspects of maintaining the digital resources stored there. This entry was posted in business case, digital preservation, digitisation, digitization, Information Systems, project update, research data management, strategy and tagged research by Dave Gerrard. Bookmark the permalink.